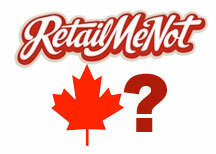 RetailMeNot Canada Announced: What Does it Mean for Canadians? Voucher Codes Canada > Bargains Blog > RetailMeNot Canada Announced: What Does This Mean for Canadians? RetailMeNot Canada Announced: What Does This Mean for Canadians? In an effort to target the Canadian market, RetailMeNot has recently announced that a Canadian version of its website will soon be coming but what exactly does this mean for Canucks? Although a large portion of frugal and regular shoppers are turning online to save money, Canadians may in fact be losing out on a number of vital discounts by turning to a website that is potentially biting off more than it can chew. At its core, RetailMeNot is an American website striving to reach the global marketplace by appealing to as many users as possible, but is this wise? While shopping in the United States has been a long-favored pass-time of Canadian citizens looking for deeper savings, now that online shopping is on the rise, perhaps the use of a solely Canadian website such as VoucherCodes.ca may in fact lead to bigger savings considering that many stores headquartered in Canada are more likely to provide online communities based in the same country as them with even better savings, especially in the form of exclusive coupon codes or promotions. Update: RetailMeNot Canada is now live. Let us know your thoughts on their new endeavor in the comments below! We’d love to hear from you on this topic! What are your thoughts on the launch of RetailMeNot Canada?